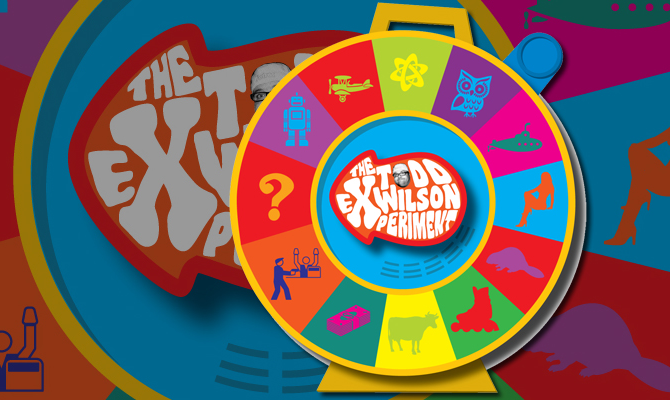 Branding for comedy show The Todd Wilson Experiment. With a wild creativity that borders on controlled chaos, the TWE performs weekly shows in Westwood, California. Whether pulling people off the street to improvise with, constructing a live game show against the audience, or playing a communal drinking game while re-dubbing a classic film, each ‘experiment’ is different and surprising. The group wanted a dynamic logo that reflected the sense of random exuberance one might experience at their shows. For this, we drew inspiration from a children’s toy (The See N’ Say), which was updated with a variety of adventures. The Todd Wilson Experiment became the arrow, directing the experience.